Design awards have become a valuable means for firms to distinguish the quality of their design work from that of their competitors, thus acting as symbols of recognition. Although their benefits appear to be clear, this empirical study contributes to the knowledge and understanding of the factors that inform how the notion of a design award is perceived by those who may take part in awards competitions. 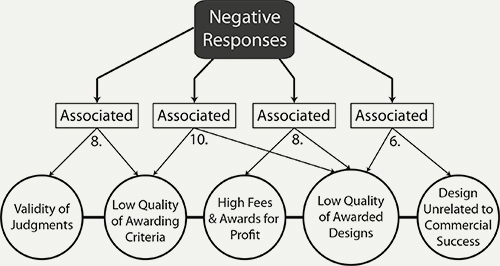 A qualitative content analysis of survey responses highlights how attitudes towards design awards are informed by perceptions of and associations between such factors as the perceived quality of awarding criteria, validity of judgments during design evaluation, perceptions of fees, and the quality of awarded designs. These factors and their associations contribute to a greater understanding of how contemporary attitudes towards awards competitions are formed. Findings are positioned to both stimulate debate and provide a point of departure for studies of attitudes towards and perceptions of various design awards competitions. Through a greater understanding of how awards competitions are perceived, opportunities exist to continue to increase their reputation for the benefit of both those that stage awards competitions and those who may participate in them. Keywords – Design Award Schemes, Selection Systems, Perception. Relevance to Design Practice – The study provides those that may wish to take part in awards with a more informed understanding of awards systems; and those who stage awards competitions insight into the principles that may inform attitudes towards awards schemes. Citation: Self, J. A., (2014). Mind the gap: Perceptions of design awards from the wild. International Journal of Design, 8(3), 123-138. Received May 30, 2013; Accepted March 23, 2014; Published December 31, 2014. Copyright: © 2014 Self. Copyright for this article is retained by the author, with first publication rights granted to the International Journal of Design. All journal content, except where otherwise noted, is licensed under a Creative Commons Attribution-NonCommercial-NoDerivs 2.5 License. By virtue of their appearance in this open-access journal, articles are free to use, with proper attribution, in educational and other non-commercial settings. Originally from the United Kingdom, James A. Self is now an Assistant Professor of Design and Director of the Design Practice Research Lab (designpracticeresearch.com) at the School of Design and Human Engineering, UNIST, Korea. Dr. Self holds a doctorate in industrial design practice from Kingston University, London. Previous to this, Dr. Self worked for several years within the design industry, both in London and Sydney, Australia. Dr. Self also holds undergraduate (BA) and graduate (MA) degrees in Design Representation, Digital Modelling and Rapid Prototyping. Dr. Self’s current research interests include design representation and practice, designerly skills and experiential design knowledge and systems of design awards. Dr. Self is a peer reviewer of international design conferences, a committee member for the DRS ESKIG group, Assistant Editor of the peer reviewed journal, Archives of Design Research and contributes regular articles to Core77. Design awards are an established part of the design landscape and an important vehicle for the promotion of design excellence and its dissemination to a wider audience (Park, Nam, & Chung, 2010; Sung, Nam, & Chung, 2010). Case studies of design excellence have often focused upon the role and importance of awards schemes in the success of business (Design Council, 1990, 2004; Gemser & Wijnberg, 2002; Lockwood, 2007; Sung et al., 2010). For example, Temple and Swann (1995) examine the British Design Awards as a means of promoting industrial competitiveness and as a benchmark for good design practices. They conclude that an awards system’s provision of a suitable benchmark for international excellence plays an important part in a firm’s ability to develop competitive strategies. However, in conclusion the authors also emphasise the importance of an award competition’s reputation as a benchmark of design excellence and a means to demonstrate good design practice. Although many previous studies explore the relationship between design awards and commercial success, little work was identified to explore perceptions of awards competitions and the possible influence this has upon the reputation of design awards. An interesting and valuable exception was found in Sung’s (2007) study of attitudes towards three awards competitions (Japan’s G-Mark and the two German design awards, iF and Red Dot) as they are perceived by 62 of Taiwan’s award winning design firms. Sung concludes that while the firms investigated value design awards, little difference is perceived between the various design competitions. Aoki, Liu, He, Zhong, and Ashizawa (2013) explore the success factors associated with Japan’s Good Design Award, concluding that an emphasis upon the development of the award’s wider social significance is a key factor for their continued success. Building upon prior work related to perceptions of design awards (Aoki et al., 2013; Gemser & Wijnberg, 2002; Sung, 2007; Sung, Chung, & Nam, 2009) the current study identifies some of the factors that inform how awards are actually perceived by those who may participate in them. With the continuing proliferation of awards schemes internationally, the identification of these factors provides a timely contribution to an understanding of the drivers behind perceptions of awards competitions. The current study is positioned to both stimulate debate and provide a point of departure for further investigation of how these factors and their associations may influence attitudes towards and perceptions of individual design awards. The evolution of design awards and their commercial and symbolic value can be traced to the British Council of Industrial Design (CoID), establish in 1944 to, “promote by all practicable means the improvement of design in the production of British industry” (Sung et al., 2009). To this end, the CoID began to stage high profile exhibitions to promote awareness of design, including Britain Can Make It in 1946 and The Festival of Britain, 1951 (Design Council, 2008). By 1957 the organisation had developed the Design Centre Award Scheme to exemplify and promote good design. Later, a renamed and restructured CoID (now the Design Council) together with the London Business School published a review of British Design Awards (Temple & Swann, 1995). The paper indicates the importance of awards as benchmarks for good design practice, and that this symbolic benchmarking is required for competitions to act as stimulus for competitiveness. With similar aims, the Japanese Ministry of International Trade and Industry founded the Good Design Awards in 1957 (then called the G-Mark System, Japan Institute of Design Promotion, n.d.) . As with the Design Centre Award Scheme in the UK, the Awards followed similar principles, namely “advancing lifestyle and industrial activities by selecting outstanding design”. In Germany, the iF Design Awards, established by the iF International Design Forum (2013) Hannover, express the objective of, “recognising outstanding design as assessed by international expert juries.” Also in Germany the Red Dot Award, founded in 1953 (Red Dot, 2013), have been internationalised under the direction of Peter Zec (2007), who describes the scheme as, “a seal of quality; it stands for membership with the best in design and business”. In the United States, the Industrial Design Excellence Awards (IDEA) were established in 1980 by the IDSA (Industrial Design Society of America) with the aim of “recognizing design excellence” (IDSA, 2013a). Since the development of these early competitions, design awards have continued to proliferate to a point where it is now a challenge to identify the number of award schemes currently in existence. For example, in a study to investigate success in design award schemes and corporate competitiveness, Sung et al. (2009) identify 22 design competitions worldwide. A review of the aims and objectives published by award schemes indicate their philosophy of the promotion of design in the interests of the design industry (Japan Institute of Design Promotion, n.d.; IDSA, 2013a; iF International Design Forum, 2013; Red Dot, 2013). However, as also noted by Sung et al. (2009), the continued commercialisation of design award schemes adds a new dimension to the staging of awards competitions. In terms of the potential commercial and marketable benefits of winning awards, Zec (2007) suggests that in a modern, industrialised society the more difficult it is for products to distinguish themselves from one another, the more important design awards become. Lockwood (2007) explains how the receipt of design awards can contribute to corporate reputation and brand image and confer prestige to the consumer. West, Collins, and Miciak (2003) describes how awards may bring publicity and attract potential clients to award-winning agencies. In the same study, however, West et al. analyse the judging and evaluation criteria of awards to conclude that a more rigorous and open criteria for panels making creative judgments is desirable. As noted by Zec (2007), an individual juror’s evaluation is by definition subjective. In terms of economic and symbolic value, three specific benefits of winning awards have been identified (Gemser & Wijnberg, 2002; Sung, 2007). First of all may be the award’s specific and tangible values. For example, awards may infer rights and privileges to awardees; the publication of winning designs in yearbooks; prize money, galas, and winners events; promotional websites and archives of winners (West et al., 2003; Zec, 2007). Awards also have value as a symbol of excellence, with awardees seen to belong to a certain group. This signals that they are aligned with the values and principles expressed by the group; the awarding body for example. A third benefit relates to the wider symbolic value of the award as a stamp of approval with the potential of providing commercial success (Zec, 2007).Of course these benefits only hold if the perceived reputation of design awards and the values they express align with the desires and values of those who receive them. Similarly to Sung’s (2007) categorisation of award characteristics, we classify the characteristics of existing awards competitions and define the ways in which the term design award is to be used as the object of this study. We then present and describe elements of Gemser and Wijnberg’s (2002) framework for the analysis of awards schemes as a conceptual scaffold for the current investigation. Various design award schemes provide categories for multiple design disciplines (Red Dot, IDEA, iF Design Awards), while others identify with specific fields such as automotive, graphic, or furniture design. Some awards target specific applicant profiles, such as the James Dyson Foundation Student Awards, while others are open to all. The frequency of awards also varies, with many annual awards (Australian International Design Awards, Core77 Design Awards); others run biannually (INDEX) or quarterly (Quarterly Design Awards). Design awards may be government sponsored or corporate events, with various associated exhibitions, publications and ceremonies. 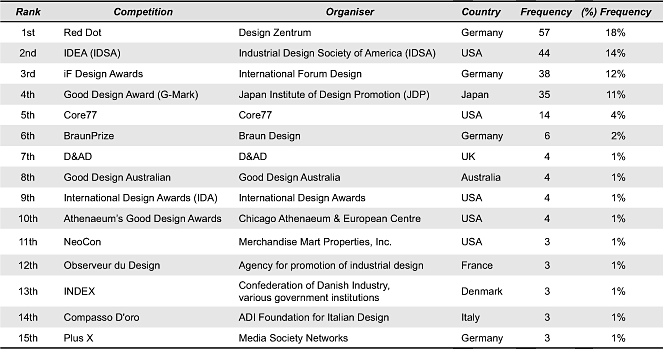 Table 1 illustrates the various characteristics of a number of the most frequently cited design awards competitions (see results section below). Table 1. Characteristics of design awards competitions. 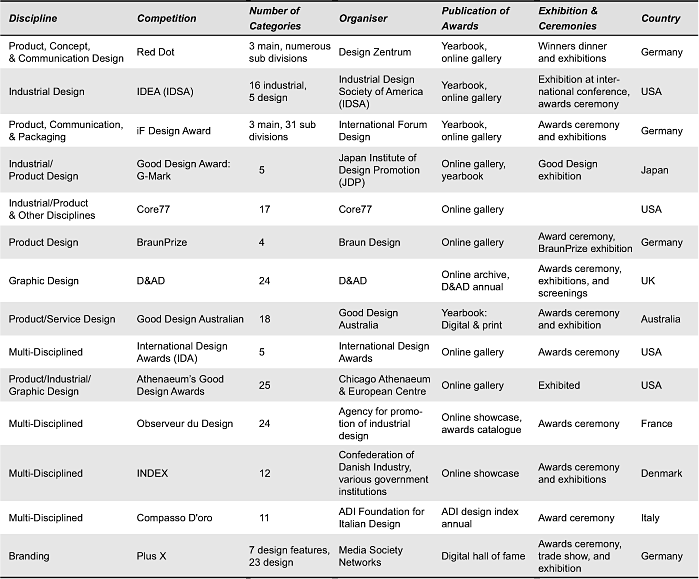 Although a thorough classification of the individual characteristics of all design awards is beyond the scope of this study, Table 1 provides an indication of the notable characteristics of often-cited awards competitions (Aoki et al., 2013; Sung, 2007; Sung et al., 2009; Zec, 2007). Design awards appear to be either discipline specific, as with Red Dot design awards (industrial/product design focused) or multi-disciplinary (International Design Awards). The number of categories within design awards may range from as few as five (Japan’s Good Design Awards) to as many as 31 (iF Design Awards). Design awards often offer participants opportunities to publish design work in digital catalogues and/or printed yearbooks. Many awards also provide opportunities for award-winning designs to be exhibited at dedicated museums (Red Dot) and more temporary exhibitions and expos (BraunPrize, G-Mark: Good Design Award). For the purposes of this study we define a design award as focused upon the evaluation and judgment of design. We use the term design award to describe a competition staged by an organization (private, NGO, governmental), the outcome of which is the awarding of prizes as recognition for good design. As such, design awards exist as a means through which good design may potentially gain greater publicity and recognition. This often takes the form of digital and published winners’ catalogs, yearbooks, awards ceremonies, exhibitions, and/or appearances at expos. Within systems of design awards, reputation appears critical. This may be seen, for example, in Aoki et al.’s (2013) discussion of reforms to Japan’s Good Design Awards, the processes of application, judgment, and presentation being revised to ‘bring the system into the open’. An award’s system of selection may be characterised as a relationship between ‘selectors’, those responsible for making decisions to produce the outcome of the process, and ‘selected’; those competing with one another for recognition (Gemser & Wijnberg, 2002). Figure 1 illustrates this relationship, with the line running between ‘Selected’ to ‘Selectors’ indicative of the aims of this study in understanding how the potential selected (those that may enter awards) perceive their selectors (those who stage awards). Figure 1. Relationship between selected and selectors within system of selection. Three types of selection system may be distinguished: market selection, peer selection, and expert selection (Gemser & Wijnberg, 2002; Sung, 2007). Design awards fall into the third: expert selection. The evaluation of the selected is dependent upon the judgment of design experts (Lockwood, 2007; Zec, 2007). Figure 2 further elaborates the stakeholders within the selection system deployed by design awards. Figure 2. 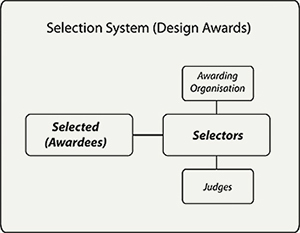 Elaboration of stakeholders within selection system of design awards. The ‘Selectors’ within a system of awards consist of two groups, those responsible for staging the awards process, ‘Awarding Organisation’, and those whose role it is to judge the selected, ‘Judges’ (Figure 2). Due to the subjective nature of the criteria used during evaluation, the reputation and influence of the judging panel is critical in ensuring the selected perceive the process of selection as fair, well informed and without bias (Gemser & Wijnberg, 2002; Zec, 2007). With the aim of acting as a conceptual framework for the current empirical study of perceptions towards design competitions, a slightly adapted version of Gemser and Wijnberg’s model is presented in Figure 3. Figure 3. Framework for assessing perceptions of design award (adapted from Gemer & Wijnberg, 2002). 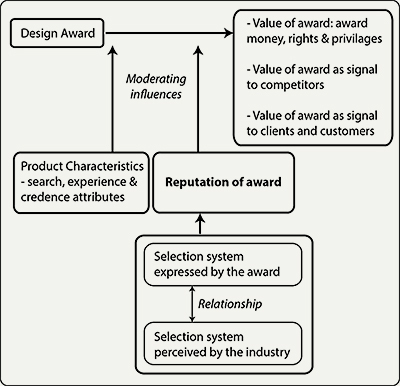 The framework suggests how a relationship between winning an award and its value is moderated by the type of product involved, ‘Product Characteristics’, and the reputation of the design award itself, ‘Reputation of Award’. Here we investigate perceptions of awards competitions to consider implications for their reputation as a means to better understand the relationship between the ‘Selection system expressed by the award’ and the ‘Selection system perceived by industry’ (Figure 3). Of course it is difficult to know if indeed improved reputation would result in a more harmonious relationship between selectors and selected. This is because the Gemser and Wijnberg (2002) model does not well reflect the wider context within which design awards and awards competitions are located. Reputation itself may not merely be a product of the relationship between the section system expressed by the award and that desired by industry; as indicated in Figure 3. Instead, other actors, individual and groups may influence and control the standing and reputation of awards, while still others play the role of mere followers. For example, Wijnberg (1995) discusses the importance that networks of groups and individuals play in informing and perpetuating the rules and conventions that govern the selection processes . Simonton (2011), in a study to explore film awards as indicators of creativity, describes how a select group of individuals, rather than the selection system itself or indeed the selected, maintain the reputation of an awards system. The self-serving opinions of the members of the Academy of Motion Pictures Arts and Sciences, who in themselves are described as being subject to political contamination, play a significant role in maintaining the reputation of the award, with others (movie fans and industry experts who lack voting membership) in this system being demoted to the role of mere passive followers. As such Gemser and Wijnberg’s (2002) model is limited in its ability to account for the various stakeholders, groups and actors that may maintain a system of design awards. Instead the model merely expresses this complex network of groups and individuals as ‘the selection system expressed by the award’. This then has implications for an analysis of the reputation of awards that does not well account for reputation as influenced by the various stakeholders who potentially make up a network of actors within an awards system (Wijnberg, 1995). Without a deeper understanding of the attitudes of the groups and individuals that may influence and maintain the reputation of awards, any analysis of reputation is limited to the provision of more general indicators of the perceived reputation of awards and the factors that may underpin and influence these attitudes. However, although the author acknowledges these wider factors and the ways in which they may serve to influence the reputation of awards, this study is positioned as a means to identify the underlying issues and principles that associate to inform perceptions of design awards among those that may take part in them. The study thus highlights important factors that inform attitudes toward awards completions. In doing, we position this work as a departure point for further investigation of these issues and how they associate inform attitudes toward various awards competitions. Future research may, for example, explore how the factors identified in this study relate to the various stakeholders and groups that initiate and perpetuate the reputation of various design awards; and what implications this may then have for the reputation of the awards themselves. We explore the reputation of the notion of a design award through an empirical study of the perceptions of those who may participate in awards competitions. Here the study’s aim is to explore the attitudes of practicing designers and related professionals. In reality a variety of actors take part in design awards, from students to educators and from academics to design professionals. Moreover, the decision to participate in an award scheme may be made at an executive or managerial level (Lockwood, 2007). Although there can be no doubt that many stakeholders participate in a decision to enter awards competitions, this study aims to identify the factors that inform the attitudes of the designers whose names appear on the awards themselves, rather than others involved in a decision to aspire to attain them. Here we wish to explicate the attitudes of potential awardees towards the awards they may receive. Survey was used as an instrument to gather data related to attitudes towards design awards. In particular we focus upon the discipline of industrial design as defined by the IDSA (IDSA, 2013b). With this focus the study employed the following criteria to identify a sample population. Participants must be engaged in design practice, education or management in a professional capacity. Responses are sort from those that describe themselves as professionally or academically associated with the profession industrial design (as defined by the IDSA). Sampling was taken through the online survey tool Net-Q. Invitations to complete the survey were posted to the JISCMAIL PhD-Design Forum, a popular discussion forum for design academics, educators and practitioners and the Core77 design research forum, a popular and internationally recognised design magazine and website. Further invitations were made via direct email to design firms and consultants. Contact information for these firms was sourced from Core77’s directory of design practitioners. The search terms industrial design and product design were used to identify respondents who potentially satisfy the two sampling criteria. The survey attracted 292 respondents, of which 94 went on to complete the survey in its entirety indicating a completion rate of 32%. This rate falls within suggested acceptable rates for self-administered surveys (Alreck & Settle, 2004) and is comparable to rates experienced by other design researchers conducting survey studies (Gemser, de Bont, Hekkert, & Friedman, 2012). 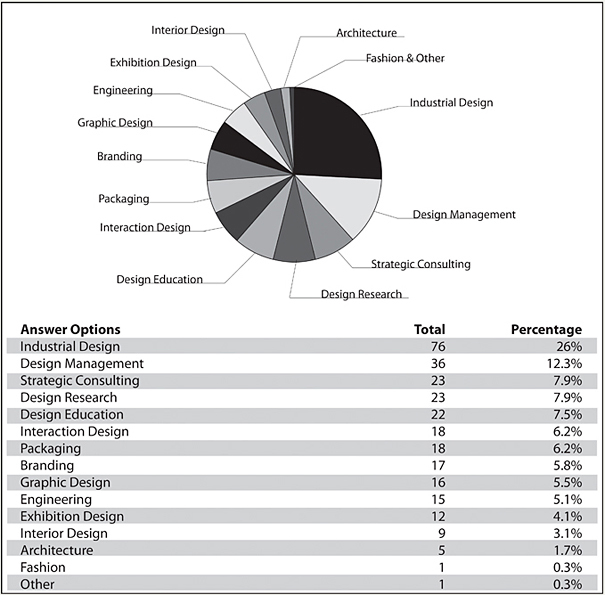 The category of Industrial Design received the highest frequency of response, 26%, followed by Design Management, 12.3%, Design Research and Strategic Consulting, 7.9%, and so forth (Figure 4). These results provide evidence to indicate a majority of the sample satisfied the two sampling criteria. Figure 4. Respondents' field(s) of expertise. Please list the leading design awards and/or competitions in your field. Example: Good Design Award, Edison Awards, Korean Design Awards. In no particular order list as many or as few awards as you wish. We consider that the comparative proportion of times the various design awards are cited reflects the award’s relative standing. To this end the survey asked respondents to list, in no particular order, the leading design awards in their field. The study then derived awards ranking from the absolute number of times an award was mentioned by all respondents (Table 2). Table 2. Ranking of design awards based upon number of times mentioned by respondents. If you would like to add any comments and suggestions related to your opinion of design awards or the aims of this study, please do so below. Qualitative responses were then analysed for emergent themes within the data in a Qualitative Content Analysis (QCA). This analysis was undertaken in three stages. First, the qualitative responses were divided into segments of discourse according to the grouping of words that appeared to hang together as a single idea, theme, or concept within the data. Segmentation of the response data was performed by a single coder over a period of approximately four days. This resulted in 98 segmented qualitative responses, or units of coding. A coding frame was then constructed based upon these units of coding. To do this the 98 segmented units were coded along two dimensions; those considered as evidence of positive attitudes towards design awards and those considered negative. In order to limit coder subjectivity, a portion of the segmented responses were coded along the negative and positive dimensions by a second coder. Results were then compared and discussed for consistency of coding. The two categories ‘Negative Attitudes’ and ‘Positive Attitudes’ constituted the two dimensions or main categories of the frame (Figure 5). Figure 5. Coding frame for survey question 2. The units of coding within the two dimensions were then analysed to identify themes within the positive and negative dimension. Seven themes related to negative and five related to positive attitudes towards design awards were identified and employed as subcategories under each of the frame’s two main dimensions (Figure 5). Finally, the units of coding within the positive and negative dimensions of the frame were coded using the seven positive and five negative subcategories. In order to assess the validity of the identified themes (their ability to describe attitudes towards design awards) and the reliability of the coding frame (its ability to classify attitudes towards awards), units of coding were coded by two coders at different times. The coding was then discussed to assess the interpretation of the categories and the ways in which units of coding were assigned to them. In this way the subjectivity inherently involved in QCA was mitigated to provide evidence of validity and reliability. This process resulted in a body of coded data expressing evidence of respondents’ attitudes toward design awards. The ranking of design awards is based upon the absolute frequency with which the various design awards were cited by respondents as a reflection of the award’s relative standing. The study derives award rankings from the absolute number of times an award was mentioned by all respondents. A total of 92 design awards (n = 92) were cited. This resulted in an extremely long tail and an indication of the proliferation of design awards globally. Table 2 illustrates those awards which received an absolute citation frequency of three or more. The awards ranked from 1st to 4th place were mentioned significantly more often than any of the other competitions (Table 2). This agrees with existing studies that indicate their significance both in terms of their history and potential for value creation (Brunswicker & Seymour, 2006; Sung, 2007; Sung et al., 2009). All four of these awards competitions provide opportunities for awardees to exhibit and showcase their work through publication and exhibition. All are annual awards, and all have comparatively longer histories and are often described as providing greater opportunities for media exposure (Sung et al., 2009). These results suggest that, despite their proliferation, the awards landscape is still dominated by the two German (Red Dot, iF), Japanese (Good Design Award), and American (IDEA) competitions. The Core77 awards were the only award scheme to approach the frequency with which the top four ranked awards were mentioned. However, given part of the sample was drawn from the Core77 directory, the implied significance of the 5th place design award may suffer from bias. These findings indicate that the visibility of design awards may depend upon their ability to perpetuate interest from industry through promotion and exposure of awardees through galas, award winning publication and exhibitions. It appears the oldest and perhaps largest design awards competitions remain foremost in the minds of the respondents. However, frequency of citation does not provide a means of assessing the reasons for the popularity of design awards as it is not possible to understand why certain awards were cited more often than others. However, the ranking does provide evidence to indicate which design awards may be foremost in the minds of the respondents as they responded to the survey’s second question. 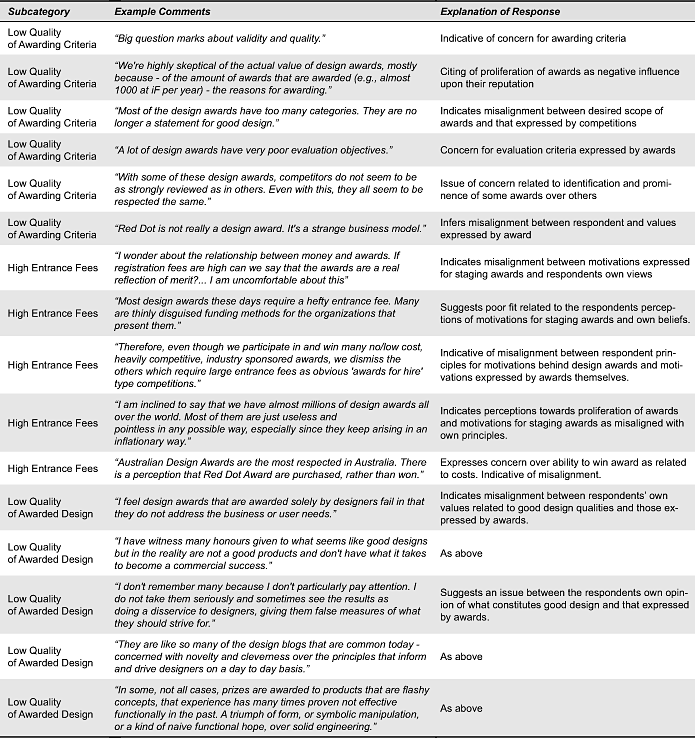 This evidence is also supported through instances of the respondents’ citation of the top ranked design awards when discussing their attitudes towards them (Table 3, ‘Low Quality of Awarding Criteria’; Table 7, ‘High Entrance Fees & Awards for Profit’ and ‘Low Quality of Awarded Designs’). Table 3. Survey Comments assigned to the three subcategories with the highest frequency of coding. In this section we analyse the perceptions of survey respondents toward awards competitions. In doing this we recognise that no distinction is made between the various awards presented in Table 2 above. Instead we aim to gather data as evidence for attitudes towards the concept or notion of a design award at a more general or abstract level. As such the study does not provide data related to any individual design award. Instead, the findings provide a starting point to explore and consider perceptions of design awards systems more generally. Figure 6 illustrates the absolute frequency of coding across the coding frame’s negative and positive dimensions. Figure 6. Absolute frequency of coding across negative and positive dimensions of the coding frame. Seven subcategories were identified from an analysis of units of coding assigned to the negative dimension (Figure 7). Figure 7. Seven subcategories of negative dimension and their absolute frequencies of coding. Of these seven subcategories, ‘Low Quality of Awarding Criteria (22)’, ‘High Entrance Fees (19)’, and ‘Low Quality of Awarded Design (16)’ received the highest frequency of coding. Table 3 illustrates example units of coding assigned to these three subcategories. ‘Low Quality of Awarding Criteria’ related to responses associated with perceptions of the criteria by which designs are judged and awarded. For example, respondent commentsindicated perceptions of the growing ubiquity of design awards, the many categories and classifications in each and the possible implications for attitudes towards awarding criteria. The following example indicates the respondent’s views towards an inflationary effect of awards, driven by their ubiquity. The response appears to suggest the implications this has for the respondent’s perceptions of the value and exclusivity of awards: Some awards lack in rigour as too many products get awarded, making the award seem less valuable. The following response indicates a misalignment between the respondent’s own criteria for the assessment of good design and that expressed through design awards. It seems that much of the criteria for awards have to do with fashionable solutions. While the selected designs are generally good ones I wonder about great designs that aren’t even submitted or those that were rejected. In this instance, the response indicates negative attitudes appear to relate to the concept of “fashionable” awards, resulting in a concern that the respondent’s own criteria for assessment remain unrecognised. In this instance perceptions of what constitutes “great design” is not well aligned with the kinds of designs benefitting from design awards, which instead is equated with the notion of a “fashionable solution”. Responses which related to expensive or unjustified entry costs were coded within the subcategory ‘High Entrance Fees’. An example is provided below. In general, in the design world, awards are rarely free. To compete you have to pay. To claim a prize you have to pay, and to get the right to communicate on the fact that you have won something - or to get the trophy - you have to pay again. Here the response suggests perceptions of costs as an influence upon the respondent’s attitude towards design awards. The response appears to indicate a perception of compounded costs and fees at various stages of a competition. Other responses indicated attitudes towards a perceived relationship between costs and the recognition of good design: Design awards today seem to be “pay-to-win exercises.” The respondent goes on, “if registration fees are high can we say that the awards are a real reflection of merit?” Here the response suggests a relationship between perceptions of costs and recognition through design awards, withhigh registration fees limiting competitiveness.. Finally, the subcategory ‘Low Quality of Awarded Designs’ was used to code responses associated with the quality of those designs judged to be good by design competitions. In some, not all cases, prizes are awarded to products that are flashy concepts, that experience has many times proven not effective functionally in the past. A triumph of form, or symbolic manipulation, or a kind of naïve functional hope, over solid engineering. The response uses the notion of, “flashy concepts” which is then equated with, “symbolic manipulation” and “naïve functional hope.” This may be evidence to indicate the respondent perceives a difference between the qualities expressed by awarded designs and a personal notion of design quality associated with what is termed “solid engineering”. It is not possible to assess the extent to which these attitudes are held or even the validity of often subjective opinions. However, these findings provide evidence to suggest a misalignment between the respondent’s opinion of the principles of good design, and those expressed by award winning designs. The nature of any misalignment as well as its possible extent, are still unclear. However, if misalignment does exist to influence the reputation of awards, as this study has begun to indicate, further identification and exploration of these principles as drivers for attitudes towards and perceptions of design awards is required. In the following response a specific design award (ranked 2nd, Table 2) was mentioned and coded as related to Low Quality of Awarding Criteria. We’re highly skeptical of the actual value of design awards, mostly because of the amount of awards that are awarded (e.g. almost 1000 at iF per Year) - the reasons for awarding. Here the respondent cites a particular design award as an example of what appears to be a concern over the quality of awarding criteria. This response may indicate the respondent associates a notion of ubiquity in the awarding of design awards and their ability to express value. It may be that the respondent associates issues or concerns for awards with those competitions most conspicuous within the awards landscape. If this is the case, questions are thus raised on the implications of negative attitudes towards the notion of a design award for those schemes that are most successful as benchmark awards competitions. It may be that negative attitudes towards the notion of a design award are projected upon those awards most close at hand; or uppermost in the minds of the respondents. Figure 8 illustrates the distribution of 22 units of coding along the frame’s five positive subcategories. Figure 8. Five subcategories along the positive dimension and their absolute frequencies of coding. In agreement with existing research on design awards (Gemser & Wijnberg, 2002; Zec, 2007), themes within the frame’s positive dimension appear to relate to an awards’ perceived, ‘High Symbolic Value’, which received a coding frequency of 12. This is a reflection of fewer units of coding assigned to the frame’s positive dimension (Figure 6). Due to the limited assignment of coding to the remaining four subcategories, we restrict the presentation of results to the subcategory ‘High Symbolic Value’ (Table 4). Table 4. Survey Comments assigned to the subcategory symbolic value. Our take on design awards is that they’re really important for two main reasons: (1) It gives a key competitive advantage. (2) They also provide important PR opportunities to keep a firm top of mind. Here the respondent equates the symbolic significance of winning awards with the perceived benefit in terms of competitive edge, “key competitive advantage” as well as opportunities to disseminate and promote the quality of design work to those that may wish to invest in it, “keep firm top of mind.” These examples provide evidence to indicate how the symbolic value of awards are perceived to provide opportunities for increased competitiveness. The analysis also suggested that awards may be seen as providing recognition from peers, “I know awards are often viewed (by peers and/or in general) as a gauge of success.” The response indicates how attitudes towards the value of design awards may relate to a perception of awards as symbols of success within a community, “often viewed by peers.” Further evidence of this was identified from units of coding assigned to the ‘Symbolic Value’ subcategory, “the awards serve to acknowledge design excellence and the designers and firms receiving them.” Here the response indicates a perception of design awards as a more enduring symbol to identify and reward good design, “serve to acknowledge design excellence.” Although we cannot say with any certainty that these responses are a true reflection of the opinions the respondents hold, they are both supported by and provide further evidence to support existing work related to positive attitudes toward the symbolic benefits design awards may bring (Gemser & Wijnberg, 2002; Park et al., 2010; Sung, 2007; Zec, 2007). Due to the limited use of the coding frame’s positive dimension in the assignment of coded responses it was not analysed to identify associations between subcategories. However, as a result of units of coding assigned to more than one subcategory of the frame’s negative dimension, associations between subcategories were identified. During the QCA, if a unit of coding was judged to relate to the subcategories ‘Validity of Judgments’ and ‘Low Quality of Awarding Criteria’ for example, the unit was assigned to both. The associations identified along the negative dimension are presented in Figure 9. As the figure illustrates the subcategory ‘Low Quality of Awarded Designs’ was used in the assignment of units of coding across three of the four associations. Figure 9. Associations between subcategories of the negative dimension. Representative units of coding assigned as both subcategories ‘Validity of Judgments’ and ‘Low Quality of Awarding Criteria’ are shown in Table 5. The findings suggest an association between attitudes towards the ‘Low Quality of Awarding Criteria’ and the ‘Validity of Judgments.’ Negative perceptions of the criteria by which awardees are judged may relate to negative attitudes toward the ability of judges to make valid judgments based upon evaluation criteria seen as insufficient or ineffective, “generally, I think awards are highly subjective and inconsistent, other than a tendency to give awards to past award winners.” Although these comments are highly subjective in themselves, the response may indicate a dissatisfaction with the ways in which awards are judged, “are highly subjective and inconsistent.” It could be that the respondent holds a perception of inconsistency in the awarding of good design, influenced by a view that past award winners are in some way favoured, “a tendency to give awards to past award winners.” We cannot say with any certainty to what extent these comments are a true reflection of the respondent’s opinion. However, the responses pose important questions related to why the respondent feels inclined to make them and what might be done by those responsible for maintaining design awards to mitigate them. It may be that these responses provide evidence to indicate a relationship between attitudes toward the ways in which awardees are judged and the criteria upon which such judgments are made. Attitudes toward criteria may be associated with perceptions of subjectivity in what the respondent may see as invalid or incorrect judgments. These findings appear to suggest perceptions of validity in both the judgments made in evaluating award winners and of awarding criteria as dependent upon and influenced by one another. If this is the case, further studies are required to examine attitudes towards awarding criteria and how these may be associated with perceptions of validity in the judging of awards. This may then reveal opportunities to identify a best approach to the design of criteria and judging frameworks as a means of mitigating negative attitudes. A second association indicated in the coded survey responses was identified between the categories, ‘Low Quality of Awarding Criteria’ and ‘Low Quality of Awarded Design.’ Table 6 provides an indicative sample of coded responses assigned to both subcategories. It seems that much of the criteria for awards have to do with fashionable solutions. While the selected designs are generally good ones, I wonder about great designs that aren’t even submitted or those that were rejected. The response appears to relate a perceived concern for the selection and evaluation of good design with the criteria used, and its inability to reward what the respondent sees as good design.. As above (Validity of Judgments and Low Quality of Awarding Criteria), the findings indicate the importance of a clear communication of awarding criteria. If these responses are indicative of the attitudes of the sample population, it appears negative perceptions of awarded designs can be extended and/or compounded by understanding of and thus attitudes towards the awarding criteria employed in the evaluation of design. If this is indeed the case, a greater understanding of the ways in which perceptions of awarding criteria influence attitudes towards awarded designs is required. This may come from further exploration of the extent of the association and its possible implications for the reputation of design awards. This knowledge may then be used to develop strategies for the development of awarding criteria and, importantly, to communicate the criteria to those that may enter design awards, with the potential to influence attitudes towards the awarded designs themselves. A third association was identified within coded responses assigned to the sub-categories ‘High Entrance Fees & Awards for Profit’ and ‘Low Quality of Awarded Designs’ (Table 7). The responses suggest awards may be perceived as motivated by a desire to benefit financially from the staging of awards competitions. An example of this is indicated in the following response, “Design awards used to promote dreams and heroes. Now they collect dollars and spoil our industry.” Here the response provides evidence to suggest some respondents may associate negative attitudes towards the perceived benefit of design awards, “spoil our industry” with a perception of awards for profit, “collect dollars”. Instances were also identified where evidence of negative attitudes towards awarded designs appeared to relate to perceptions of prohibitive costs of entry. I wonder about the relationship between money and awards. If registration fees are high can we say that the awards are a real reflexion of merit? Here the response provides evidence to suggest an association between negative attitudes towards costs and fees, “fees are high” and the quality of awarded designs, “reflection of merit.” The respondent’s attitudes towards the merit of awarded designs may depend upon and be influenced by a perception of the financing of competitions. From this study alone it is unclear of the scale or scope of this possible association. However, the findings are indicative of a relationship between negative perceptions associated with the respondent’s understanding of the financial motivations for staging an awards competition, and how these then have implications for attitudes towards the awarded designs themselves. Taken together the responses provide evidence to suggest how perceptions of a financial dimension to the staging of competitions appear to have implications for how the quality of awarded design is perceived. If this association does exist to any great degree, a deeper understanding of how attitudes towards quality are associated with perceptions of the ways in which competitions are financed could provide insights into how attitudes towards awarded designs are formed. This knowledge could then offer opportunities to develop strategies to allay possible concerns over financing with the potential to improve perceptions of the quality of awarded designs. If well communicated to participants, this has the potential to provide opportunities to improve the reputation of design awards for the benefit of both awardees and those who stage design awards. Perceptions of the quality of awarded designs may be influenced by pragmatic attitudes towards any potential for commercial viability. The strength and scope of this relationship is still unclear. 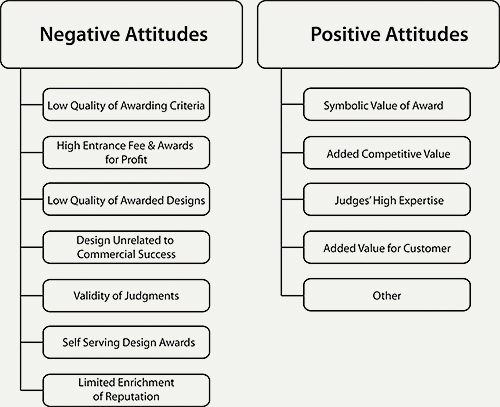 However, if these responses are indicative of an association, it is important to develop a clearer understanding of how potential for commercial success is assessed within awarded designs by those who would enter design awards, and to then explore any relationship between the assessment of awarded designs and perceptions of their ability for commercial success. This may provide greater opportunities for those that stage awards competitions to consider how perceptions of commercial success may influence attitudes towards the quality of awarded designs. As a result, strategies may be developed that both provide opportunities to evaluate potential commercial success and better communicate evidence of the commercial viability of awarded designs to those that would enter design competitions. The study employed a qualitative approach to analyse attitudes toward the reputation of design awards. Taking this approach we aimed to draw out some of the underlying issues that serve to inform attitudes towards awards competitions. Although positive attitudes towards award competitions were evident in the survey sample, qualitative responses encoded along our coding frame’s negative dimension outnumbered positive responses by a frequency of more than three to one (negative responses f = 74, positive responses f = 22). In agreement with existing literature (Gemser & Wijnberg, 2002; Park et al., 2010; Sung, 2007; Zec, 2007), positive responses were most frequently encoded as indicative of a belief in the symbolic value of winning design awards. As suggested by Zec (2007), symbolic value relates to the perceived recognition awards can bring, both to potential clients and as a sign of excellence among peers. In the encoding of positive responses, the coding category ‘Symbolic Value’ was the most frequently used category along the coding frame’s positive dimension. What drivers the recognition of design awards as indicators of design quality among peer and how can recognition be best maintained? Although the current study was unable to indicate the specific drivers behind the recognition of value in design awards competitions, negative responses provided evidence to show how attitudes towards distinct components of an award system may undermine their reputation. Among negative responses, respondents most frequently cited a concern for the quality of awarding criteria, encoded as ‘Low Quality of Awarding Criteria’ (f = 22). Further analysis of responses within this category indicated concerns for the relevance or adequacy of criteria for assessing exemplary design, with respondent attitudes towards assessment criteria instead influenced by their own beliefs of what constitutes outstanding design. For the respondents, if criteria appeared unrelated to their own criteria for evaluating outstanding design, this also resulted in uncertainty over the quality of the criteria upon which judgments are made and the quality of the awarded designs themselves. A further associations analysis of encoded responses assigned to the frame’s negative dimension indicated how the respondents’ core concern for assessment criteria served to also influence both attitudes towards the awarded designs themselves and the validity of the judgments upon which design awards are awarded. If this is representative of more widely held beliefs among those who may enter awards competitions, a key requirement for the maintenance and development of the reputation of design awards appears to be a competition’s ability to justify the criteria used, how it is applied and how awarded designs reflect the criteria upon which they are assessed. The encoding category ‘High Entrance Fees’ was also used comparatively often in the encoding of negative responses. The associations analysis again indicated a relationship between attitudes towards entrance fees and the encoding category, ‘Low Quality of Awarded Designs’, with responses indicating the influence concern over affordability had for attitudes towards the quality of the awarded designs themselves. If this is indicative of a relationship between the affordability of entrance and attitudes towards design quality, perceptions of affordability have wider implications for the reputation of design awards. For competitions to build their reputation as benchmarks for design quality among peers, design awards may wish to clearly justify entrance fees, emphasising the value and benefit of participation. This may then help to dispel negative attitudes towards affordability as well as the wider implications unaffordability may have for attitudes towards the quality of the awarded designs themselves. Within survey comments encoded along the coding frame’s negative dimension, a further association was identified between responses encoded as ‘Low Quality of Awarded Designs’ and ‘Design Unrelated to Commercial Success.’ This association indicated that, for some respondents, negative attitudes towards the quality of awarded designs was influenced by the level of commercial success awardees are able to achieve. If this is indicative of beliefs more widely held by those who take part in design awards, competitions that highlight how awarded designs achieve market success and profitability will enhance the reputation of award winners. This then has the potential to increase the significance of winning awards for the benefit of the competitions themselves and for those who may enter them. This study has explored attitudes towards and perceptions of design award competitions. Within this analysis specific components of design awards systems were identified as influencing respondent’s attitudes, with implications for the reputation of awards competitions. Specifically, attitudes towards the quality of awarding criteria cost of entry and quality of awarded designs emerged as influential to the attitudes of our respondents. These also appeared to relate to informing the reputation of the awards systems. This study contributes to an understanding of how design awards are perceived by achieving an initial mapping of the components of design awards system that appear most influential in informing respondent attitudes. We have presented and discussed the components of awards system that appear most important in effecting more holistic attitudes to awards competitions. To continue the development and maintenance of their reputations, competitions may wish to further explore how for example, their own articulation of criteria for assessment may have implications for the reputation of awards. Our findings may also be of value to design researchers in studies aimed at further exploring how attitudes towards individual components of a system of design awards may relate to influence their reputation. As reputation is critical to the continued success of design awards competitions (Zec, 2007), further studies to explore how reputation is perceived by those who may enter awards competitions will provide opportunities to maintain and develop reputation for the benefit of both competition organisers and awardees. Design awards are of growing importance to the landscape of contemporary design. They provide a valuable opportunity to promote design within the industry and to a greater public. However, in order that design awards continue to develop and maintain their reputation for the recognition of outstanding design achievement, competitions may consider how the distinct components of their awards systems work together to inform more holistic attitudes towards the significance of the awards themselves. There has yet been little empirical work to examine the reputation of design awards among peers, namely those who may take part in awards competitions. Our findings are positioned to both stimulate debate and provide a point of departure for further investigation of attitudes towards and perceptions of awards competitions. Further studies might, for example, explore the drivers behind the building and maintenance of reputation among successful competitions and how these are communicated to potential entrants. This research, and other studies like it, may then have further pragmatic application in the development and staging of successful and desirable design awards. We would like to thank all those designers and design educators that took the time to answer our call for participation. We would also like to thank Khan Rao Shahzaib Ali for his research assistance on this project. This work was supported by the year of 2013/14 Research Fund of the Ulsan National Institute of Science and Technology (UNIST). Alreck, P., & Settle, R. (2004). The survey research handbook (3rd ed.). London, UK: McGrew-Hill Irwin. Aoki, S., Liu, M., He, X., Zhong, Y., & Ashizawa, Y. (2013). The success factor of good design award as a promotion policy. Proceedings of IASDR Conference on Design Research (pp. 4172-4182). Tokyo, Japan: Shibaura Institute of Technology. Brunswicker, S., & Seymour, R. (2006). Surprise! Look who’s capturing the value created from a design excellence award. In Proceedings of the International Conference on Strategic Innovation and Creativity in Brand & Design Management (pp. 220-235). Boston, MA: Design Management Institute. Design Council. (1990). Design to win: Case histories. London, UK: Author. Design Council. (2004). The impact of design on stock market performance - An analysis of UK quoted compaines 1994-2003. London, UK: Author. Gemser, G., de Bont, C., Hekkert, P., & Friedman, K. (2012). Quality perceptions of design journals: The design scholars’ perspective. Design Studies, 33(1), 4-23. Gemser, G., & Wijnberg, N. M. (2002). The economic significance of industrial design awards: A conceptual framework. Academic Review, 2(1), 61-71.
iF International Design Forum. (2013). iF design awards 2013: Product (Vol. 1). Hannover, Germany: iF Design Media GmbH. Lockwood, T. (2007). Design value: A framework for measurement. Design Management Review, 18(4), 90-97, 100. Park, J. M., Nam, K. -Y., & Chung, K. -W. (2010). Promoting design nationally: Influential factors. Design Management Journal, 5(1), 32-39. Simonton, K. (2011). Film awards as indicators of cinematic creativity and achievement: A quantitative comparison of the Oscars and six alternatives. Creativity Research Journal, 16(2), 163-172. Sung, T. -J. (2007). An empirical study of the perceived values of world-class design awards for Taiwan’s design-award-winning firms. In Proceedings of IASDR Conference on Design Research. Hong Kong: Hong Kong Polytechnic University. Sung, W. O., Chung, K. -W., & Nam, K. -Y. (2009). Reflections on design excellence through international product design award schemes. The Design Journal, 12(2), 171-194. Sung, W. O., Nam, K.-Y., & Chung, K.-W. (2010). Strategic use of international product design award schemes. Design Management Journal, 5(1), 72-86. Temple, P., & Swann, P. (1995). Competitions and competitiveness: The case of British design awards. Business Strategy Review, 6(2), 41. West, D. C., Collins, E. L., & Miciak, A. (2003). Management perspectives of awards for creative advertising. Journal of General Management, 29(2), 23-34. Wijnberg, N. (1995). Selection processes and appropriability in art, science, and technology. Journal of Cultural Economics, 19, 221-235. Zec, P. (2007). Design on stage - The red dot design award. Design Management Review, 18(1), 60-67, 93.